Kenneth Wayne "Ken" Dryden, PC OC, (born August 8, 1947) is a Canadian retired NHL goaltender. Born in Hamilton, Ontario, on August 8, 1947, Dryden was originally drafted by the Boston Bruins in 1964. Rather than play in Boston, Dryden decided to pursue a Bachelor of Arts degree at Cornell University, where he also played hockey until his graduation in 1969. At Cornell, Dryden led his team to the 1967 NCAA championship and three consecutive ECAC tournament championships. 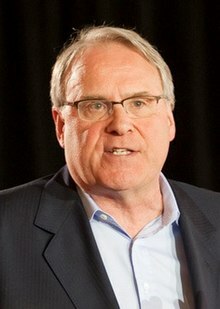 Ken Dryden made his NHL debut in 1970 for the Montreal Canadians, and became the backbone of six Stanley Cup winning teams in the 1970s. Dryden played from 1970-79 (excluding the 1973-74 season when he retired to pursue the requirements for his law degree) and was elected to the Hockey Hall of Fame in 1983. After retiring from hockey Dryden became an author and business man. His 1983 book The Game was a commercial and critical success being nominated for a Governor General's Award, the book was about the pressures of being a goalie in the NHL. He then became president of the Toronto Maple Leafs hockey club in 1997. Dryden was the member of the Canadian Parliament for York Centre from 2004-2011. This page was last changed on 22 June 2017, at 11:03.